ww2dbaseOsami Nagano was born in 1880. As a naval officer, he established a strong record in administration. He studied in the United States during the 1910s and was naval attaché to the US between 1920 and 1923. In Dec 1935, he represented Japan as the chief delegate at the Second London Naval Conference. 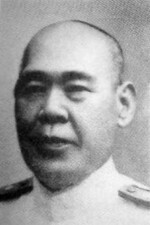 Between May 1936 and Jun 1937 he was the Navy Minister under Prime Minister Koki Hirota. In Dec 1937, he was named commander in chief of the First Fleet and the Combined Fleet. From Apr 1941 to Feb 1944, he was chief of the Navy General Staff. Although he was a proponent of a southward expansion, he was against a war against the United States; he deduced that if even Japan was to take over British and Dutch colonies in Asia, the isolationist United States still would not enter the war against Japan, leaving Japan to establish her empire without the interference from the industrial giant. However, like he had done so a number of times before, he entrusted too much of strategic planning to Isoroku Yamamoto and his staff officers, essentially giving away control of the entire navy to the Combined Fleet. Yamamoto, although not a supporter of a war against the United States either, dutifully accepted his orders and led the Japanese Navy into the great attack at Pearl Harbor that brought the US into war. Nagano essentially lost real control of the navy after Pearl Harbor; Yamamoto had, in effect, gone as far as to tell Nagano "not to interfere too much and thus set a bad precedent in the navy." From Feb 1944 to the end of the war, he was Emperor Showa's personal naval advisor. ww2dbaseAfter the war, Nagano was among the highest ranked officers interrogated by United States naval officers. He was described as "thoroughly cooperative", "keenly alert", "intelligent", and "anxious to develop American friendship". He was subsequently tried as a war criminal, but died in 1947 before the trial ended. ww2dbaseSources: Interrogation of Japanese Officials, Nihon Kaigun, Shattered Sword. 2 Feb 1937 Osami Nagano was named the commander-in-chief of the Japanese Navy Combined Fleet.